To run great looking Live or On-Demand webinars directly inside a HubSpot landing page please follow the instructions below. You must have an event created within your WorkCast account that has media attached. 1) As a HOST or PRODUCER USER, login to your WorkCast account and navigate to the ‘Events’ tab and then locate the event you require to embed within your page and click on that event. 2) Ensure the ‘Event Experience’ tab is displaying within the 'Event Setup' section. You will now see either a single event session or multiple depending on your event configuration. To the right of each expanded session there is a document icon. Please click the 'Document Icon'. Within the popup select your 'Embed Code Type' which should be 'HubSpot Integration' and then select the 'Embed Code Domain'. If no options exist in the domain drop down list please send a request to events@workcast.com with your required website domain address where the video will be placed (eg http://www.yourwebsite.com). 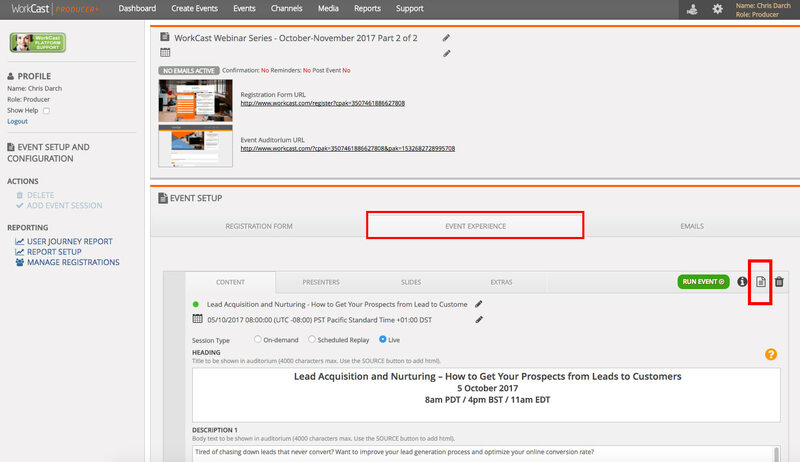 3) Copy and Paste this information and add to a HubSpot created event landing page within your HubSpot account. You will need to make sure you select '<>' in the landing page editor to select source, and then paste the embed code. Note: To update the holding image for the embedded media within the event session in your WorkCast account, you would need to ‘upload media splash’ by attaching your saved image. You are able to create a fully automated live event workflow within HubSpot that includes a registration process and email reminders with access details for the event.